Early Monday morning, it was announced that Dustin Ackley had played himself out of a job with the Mariners and was sent down to Tacoma. Packing his bags right next to him was Lucas Luetge. I don't think Luetge getting sent down was anything more than needing another arm in the bullpen after the past week the Mariners have had. The 7.15 ERA probably doesn't help, but that's not entirely Luetge's fault. 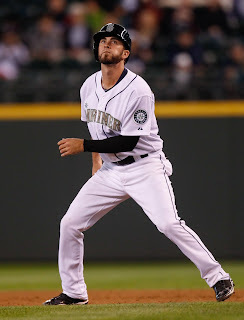 Nick Franklin and Hector Noesi came to the Mariners in place of Ackley and Luetge. We know what Noesi is, which is a decent bullpen arm and maybe a serviceable spot starter at this point. With Franklin, who knows? Looking at his PCL numbers does a person no good since it's the PCL and your mom could hit .250 with 10 home runs in that league. A slight exaggeration, but not much. Now we explore what this all means for the Mariners going forward. First, we'll start with Luetge. There's not a whole lot to be said, except the fact that I don't think he's being put in a position to succeed in the first place. His deliver is more of a 3/4 delivery rather than over the top, which gives him that good sweeping slider and curve that gives lefties headaches. With 3 lefty relievers at the time, Luetge didn't need to be anything more than a LOOGY, which is all he is right now anyway. A span of 53 plate appearances for any pitcher is almost nothing, even less so when you break it into platoons, but that's what I'm going to do. I'm not going to quote numbers, save for two: plate appearances with left-handed hitters and right-handed hitters. So far this season, Luetge has faced a lefty in 16 plate appearances versus 37 against right-handers. Putting him in a position where he's facing that many righties, he's going to get hit. As I said before, he is and will be for the foreseeable future, a LOOGY. Giving last year as an example, he faced 80 righties and 98 lefties. Against righties: .318/.425/.470. Against lefties: .193/.289/.241. The only thing that's changed so far this season is how he's being used. And now, Ackley. Oh boy, what a fall from grace he has taken. From one of the core players of the future to wondering whether or not he'll be a decent enough regular. JJ already discussed Montero, whose problems were based somewhere between trying to learn how to catch and developing as a hitter. As for Ackley, there really is no reason for his struggles except that maybe he just isn't as good as people thought he'd be. After tearing it up in the last half of 2011, he hasn't done much of anything since. In 2012, his best month was August, when he hit .257 in 113 at bats. He also hit .255 in May last year. Other than those two months, he hasn't had one where his average has been above .250. The power and speed we saw in his half a season of 2011 had disappeared, along with his ability to hit. There were some (me included) who thought that his ankle injury had something to do with it and, after having surgery this offseason, would be back to his 2011 self, or at least close to it. I think it's safe to say, we were wrong. In the two months of 2013, Ackley has shown pretty much nothing. In April, he had 71 at bats, hitting .253 but with absolutely no power. Out of 23 hits, he had 3 doubles and that was it, while driving in one run. In 71 at bats for the entire month of April, he had one RBI. As April turned to May, he did manage to hit a home run and drive in 7, but also hit .138 for the month. Ackley has been something of a mystery after almost two full seasons and it hasn't shown any signs of improving. Out of curiosity, I decided to take a look at his plate discipline numbers on FanGraphs and, shockingly, his plate discipline numbers are actually better so far this year than they were last year. Most of them anyway. Instead of throwing all of the numbers at you and wishing you luck, I'll toss out a few and explain along the way. ....his Z-Swing% is the same way, 56.8% in 2012 and 52.5% in 2013. Basically, Ackley is watching more pitches go by him at the plate than he has in the past. I don't know where the line is between good plate discipline and just not wanting to swing, but whatever it is, I'm pretty sure Ackley is on the wrong side of it. As for Contact%, he's improved this year, going from 86.1% last year to 88% this year. So yes, he's making more contact, but his ground ball rate has jumped from about 45% last year to 55% this year. He's making contact, but hitting it into the ground. I'm not sure how or even if Ackley can get it turned around. It's entirely possible that the front office missed with Ackley and he'll never be anything more than a second division starter at best. He's still young enough that he figures it out and goes on to have a good career with the Mariners, but only time will tell with that. If he can figure out what he's doing up at the plate, maybe we can all start hoping again. As for Franklin, I honestly have no idea. The numbers don't tell us anything of value and the debate of whether he is or is not ready won't be decided until either the end of the season or if he's sent down. As with most things in baseball, you really have no idea until the end of the game season. Even then its not a guarantee. We have Ackley as proof enough of that. Can Franklin be an improvement over Ackley? Absolutely. Can Franklin crash and burn, getting sent down in a month? Absolutely. Like all call-ups of rookies, you have no idea what you're going to get until the player steps on the field and plays. Now we wait and see if Franklin was ready for this.